The Biological Advantage of Being Awestruck - by Jason Silva on Vimeo. I've been reading a lot lately on the evolutionary advantages of storytelling—first in Brian Boyd's monumental On the Origin of Stories, which treats art in general and stories in particular as an adaptive response, and now in Jonathan Gottschall's The Storytelling Animal, which describes fiction as "a powerful and ancient virtual reality technology that simulates the big dilemmas of human life." So when Jason Silva (who was featured in conversation on this blog last month) posted a video the other day about the evolutionary edge that stems from the state of wonder, I took notice. Jason's video was inspired by his own reading—in particular, Nicholas Humphrey's Soul Dust: The Magic of Consciousness, which the Times Book Review described as "exuberant," and Ross Andersen's "Golden Eye," an essay on the marvels of deep space that appeared in the LA Review of Books. Jason borrowed the title for his video from Humphrey, but the exuberance is all his own. Enjoy. 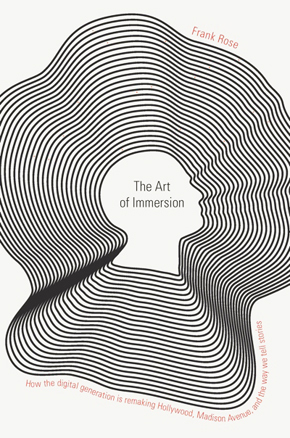 Several months ago, as I was finishing a video on the making of The Art of Immersion, Paul Woolmington of Naked Communications suggested I use the book's YouTube channel to create a conversation about the issues the book raises—for example, how the Internet blurs the distinction between author and audience, story and game, entertainment and marketing, fiction and reality. It's taken awhile, what with my travel schedule and a bit of consulting work I've taken on, but the idea is finally being realized. First up: Chad Stoller, managing director of the newly opened IPG Media Lab in New York, on the blurring of entertainment and marketing—otherwise known as branded entertainment. "Creativity, Celebrity and Brand Strategy: A Brisk Discussion of Ozzy and Machete" takes place at 4:30 PM Monday at the Austin Convention Center's PepsiCo Plugged-In Stage. What happens when you blur the line between advertising and entertainment? In the case of "Brisk Machete," a minute-long stop-motion video in which Danny Trejo reprises his role in Robert Rodriguez's Machete on behalf of Brisk Iced Tea, something very funny indeed. TV watch: Will Hulu become a victim of its own success? Hulu, the online TV service launched two years ago by Fox and NBC, has enjoyed incredible success with viewers — too much, it may turn out. Two weeks ago, comScore’s report that Hulu had pulled into the top three streaming-video sites was quickly followed by news that Disney — the corporate parent of ABC and ESPN—was taking a stake in the venture. But in the long run, those two milestones could be overshadowed by a seemingly much smaller bit of news: the decision in January to pull most episodes of It’s Always Sunny in Philadelphia from the site.